This book captures similarities or parallels of President Barack Obama and Abraham Lincoln in private and public life through an intriguing, story-like style rather than just a generic display of separate lists of likenesses or differences between the two. 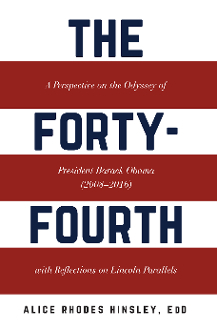 The narrative creates a pensive argument on the perspective of Barack Obama’s presidency by analyzing the appeal and hatred directed to the forty-fourth and sixteenth presidents. This presidential narrative includes vignettes about both presidents and family in brief, descriptive, engaging terms as it piques your curiosity to find out more. The author clearly shows the relevance of yesterday and today’s unsettling times of division, partisanship, polarization, crisis, and obstruction as related to social justice, including growing racial tension, all jeopardizing modern progress and advancement now and in later years. However, from this reading, you experience a refreshing reminder of the brilliance and ethics of President Obama, which highlights and reflects on his effective, straitlaced presidential leadership style. Still, as an unlikely candidate, he rose to presidency, demonstrating his genius and that, historically, his time had come to serve and lead the country. Additionally, this presidential legend is a lesson on Obama’s powerful capacity of deliberative and thoughtful executive decision-making, which established positive consequences for the people of the nation.